« Am I a Racist? Are You a Racist? Team sports, such as doubles tennis, require that you depend heavily on others to cover the territory when you cannot. To read your mind. To know your partner’s and opponents strengths and weaknesses. This is true of any team sport. And in doubles, where the team is just two people, the pressure to perform is that much greater. During the summer I play lots of doubles while on Martha’s Vineyard with the Ladies of the Court at Matakesett Tennis Club. Occasionally I am asked to play outside of our Tuesday/Thursday round robins where we change partners every 5 games. Some days I do well, others I do less well. Oh, well. And though I have known some of them for more than 20 years, I still get nervous about my playing. Are my serves strong and consistent? Can I make that lob land just on the line? Will I react fast enough to the volleying at the net? Am I playing well enough so I don’t ruin everyone’s game? Yes, all this, and more, rattles around in my head probably crowding out the greater good it would do to keep my eye on the ball and the other players, i.e. hit the ball where they are not. The added pressure of doubles is compounded by the ubiquitous, “I’m sorry,” when someone misses the shot–forced error or just plain momentary lack of talent. This is what bothers me most. Why apologize for something that is just part of the game, that is, missing the shot. After all, someone, sometime, has to miss the shot. I ask people not to say “sorry.” Is this bad tennis etiquette? Is it insensitive to someone’s need to unload their less than perfect performance on me? Or is it just silly? Apologies are easy to deliver. True remorse, so much more difficult. And how can remorse over a tennis shot really make a difference? Better to save that miniscule amount of energy and drive it inwards to increased determination to beat the other team on the next point. 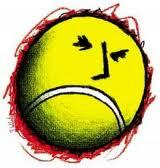 So as I sit here on this almost rainy afternoon, replaying my not-my-best morning of tennis this year. I proudly recall saying “sorry” only once when I really let my team mate down–she really did think I should have made the shot. And she was right. I think we lost that set 3-2. I tried to get a singles game for tomorrow morning, but no takers. If only I could find someone else who knew how wonderful it is to run around, get all sweaty and not ever have to say, “I’m sorry.” Ah, it would be a perfect end to a near perfect tennis week. This entry was posted in The Confessional, Travels with Linda and tagged Add new tag, doubles tennis, Martha's vineyard, singles tennis, tennis. Bookmark the permalink. Post a comment or leave a trackback: Trackback URL.